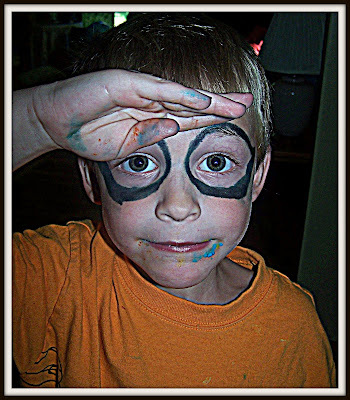 If you ever find yourself in a craft store and pick up a black "Face Paint" marker then let your son play dress-up with it on a Saturday afternoon, you can fully expect that all the scrubbing in the world will merely lighten those darkened circles around his eyes into a grayish/blueish "bruise" color causing everyone you attend Church with on Sunday morning to ask with concern,"What happened to him?" But the upside will be that for once you can say, "Nothing. It's just a little face paint is all," as opposed to having to explain, for instance, that the burning smell emanating from his hair and skin and sweater is indeed from him having caught himself on fire with a candle or that the scratch marks on the back of his head were from him tumbling out of a second-story window. I share all of this to remind you, dear friends, that washable doesn't always mean what we think it should. It's "washable" in the sense that you can wash and wash and wash it to your heart's content, and then you can wash it some more! He looks like a cute little ghoul!!!! This happened to me once except that the colour was orange (tiger faces) and my children looked like they had jaundice. Oh, this takes me back to those childhood days! My sister once gave herself a bruised chin by sucking a cup onto her face. And I used to use some of my mom's old makeup to give myself a black eye. That's funny. I'm sure I'll see some of this in the years ahead with my 2 boys. BTW, I don't see your Hesitant Homeschooler link anymore; am I blind or did you opt out of sharing that experience with the world? I was looking forward to it! Scotch tape?! I love it! I will definitely try that next time. Thanks for the tip Sylvia! I laughed out loud, Kelly and Selena, about your jaundice children and your sister who bruised her chin with the suction from a cup. Aren't kids crazy? I have not abandoned the Homeschool Blog as of yet but I was toying with the idea of merging my homeschool experiences on to this one. We'll see, as I get started, how much venting I'll need to do from day to day:).